SRS components are located in this area. Review the SRS component locations (see page 24-23) and the precautions and procedures (see page 24-25) before doing repairs or service. - Driver's seat is shown; passenger's seat is similar. 2. Driver's seat (10-way power seat): Remove the screw, and release the hook (A), the tabs (B), and the pin (C), then remove the front cover (D). 3. Driver's seat (10-way power seat): Remove the recline cover (A). -1. 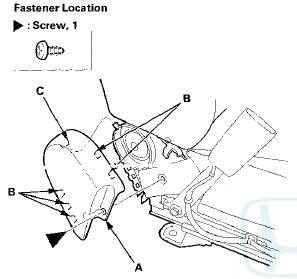 Remove the screw, and detach the clip. -2. Release the tabs (B). -3. Pull up the cover, then release the hook (C). -4. Disconnect the power seat adjustment switch connector (D) and the lumbar support switch connector (E). -5. 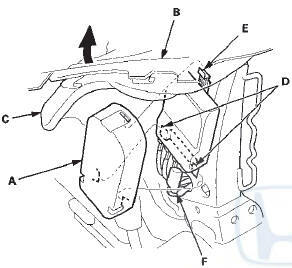 Remove the wire harness (F) from the hooks (G). 4. Driver's seat (manual height adjustable seat): Pull back the cap (A) to release the hooks (B), and remove the screws, then remove the height handle (C). 5. Driver's seat (manual height adjustable seat); Remove the recline cover (A). -1. Remove the recline knob (B) and the screw. -2. Gently pull out the cover to detach the clip, and release the hooks (C, D) and the tabs (E). 6. Passenger's seat; Remove the screws, then remove the rear seat access knob (A). 7. Passenger's seat: Remove the recline cover (A). -2. 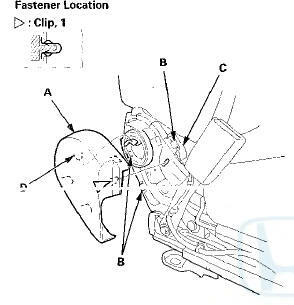 Gently pull out the cover, then detach the clips, and release the hooks (C) of the recline inner cover (D). -3. Release the rear seat access lever (E). 8. 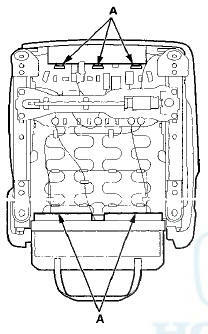 Driver's seat (10-way power seat): Remove the center cover (A). -2. Release the tabs (B), then remove the center cover. 9. Driver's seat (manual height adjustable seat): Gently pull out the center cover (A) to detach the clip, and release the hooks (B) of the center inner cover (C), release the hook (D), then remove the cover. 10. 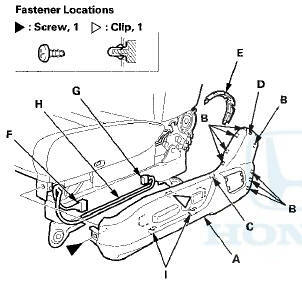 Passenger's seat: Gently pull out the center cover (A) to detach the clip, and release the hooks (B) of the center inner cover (C), then remove the cover. 11. From under the seat cushion, release the elastic strap (A) from the seat cushion frame springs (B), then pull back the under cover (C) of the back cover. 13. Detach the harness clip(s) (H) and remove the wire tie(s) (I). 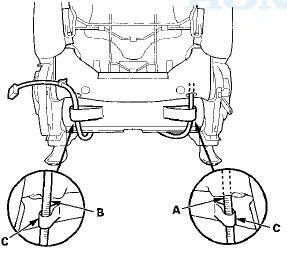 Driver's seat (manual height adjustable seat): Pry up the hooks (J) of the harness holder (K), then release the holder from the seat cushion frame spring (L). 14. Driver's seat (10-way power seat): Release the wire tie (M) of the harness clip fastening the recline motor harness, the seat-back heater harness, and the seat cushion heater harness together. 15. 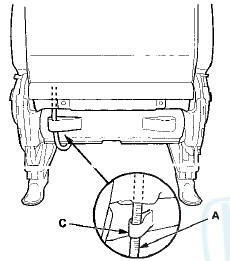 Driver's seat (10-way power seat)/passenger's seat: Remove the screws, then gently pull down the back panel (A) to release the hooks (B) from the seat-back frame, and remove the panel. 16. Driver's seat (10-way power seat)/passenger's seat: Release the lower and inside hook strips (A). 17. 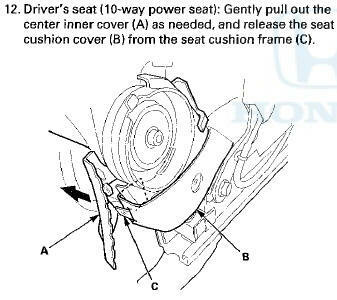 Driver's seat (10-way power seat): Remove the lumbar support motor cover (A). -1. Turn over the seat-back cover (B) and the pad (C) as needed. -2. Release the cover from the lower hooks (D). -3. Pull the cover upward to release it from the upper hook (E). 18. Driver's seat (10-way power seat): Disconnect the seat wire harness connector (F). 19. Passenger's seat: Remove the ODS unit cover (A). 20. Passenger's seat: Disconnect the seat wire harness connector (F). 21. Driver's seat (10-way power seat)/passenger's seat: Detach the harness clip (A), then pull the seat wire harness (B) in through a hole in the seat frame, and pull it out through the harness hole (C) in the seat-back cover (D). The passenger's seat is shown; the driver's seat is similar. 22. Driver's seat (10-way power seat): Pull out the side airbag harness (A), the recline motor harness (B), the seat wire harness (C), and the seat-back heater harness (D) through the loops (E). 23. Driver's seat (manual height adjustable seat)/ passenger's seat: Pull out the side airbag harness (A) and the seat wire harness (B) (passenger's seat), through the loop(s) (C). 24. Release the hook strips (A) from both sides of the seat cushion frame. 25. Release the hook strips (A) from under the seat cushion. The driver's manual height adjustable seat is shown; the other types of seats are similar. 26. Remove the seat cushion cover/pad (A) from the seat frame (B). 27. Release the upholstery rings (A) from under the seat cushion (B). 28. Pull back the edge of the seat cushion cover (A) all the way around, and release the upholstery rings (B), then remove the cover. 29. Install the cushion cover in the reverse order of removal, and note these items: - If the clip are damaged or stress-whitened, replace them with new ones. - To prevent wrinkles when installing the seat cushion cover, make sure the material is stretched evenly over the pad before securing the upholstery rings and hook strips. 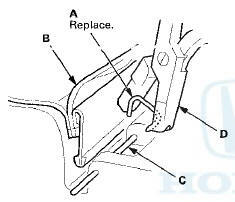 - Replace all of the upholstery rings (A) fastening the seat cushion cover (B) to the pad wires (C) with new ones using commercially available upholstery ring pliers (D). 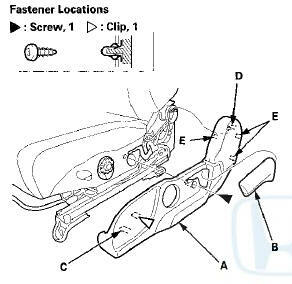 - Use the appropriate tool from the KTC trim tool set to avoid damage when removing components, - Driver's seat is shown; passenger's seat is similar. 2. 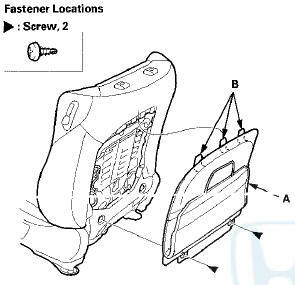 Driver's seat (10-way power seat): Remove the screw, and release the hooks (A), the tabs (B), and the pin (C), then remove the front cover (D). -3. Pull up the cover, then release the hook (C) and the tab (D). -4. Remove the upper recline inner cover (E). -5. Disconnect the power seat adjustment switch connector (F) and the lumbar support switch connector (G) (for some models). -6. 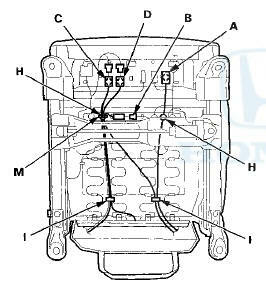 Remove the wire harness (H) from the hooks (I). 4. Driver's seat (manual height adjustable seat): Pull back the cap (A) to release the hooks (B), and remove the screws, then remove the height adjuster handle (C). 5. Driver's seat (manual height adjustable seat): Remove the recline cover (A). -2. Gently pull out the cover, then detach the clip, and release the hooks (C, D) and the tabs (E). 6. Passenger's seat: Remove the recline cover (A). -2. Gently pull out the cover, then detach the clip and release the hooks (C) and the tabs (D). 7. Driver's seat (10-way power seat); Remove the center cover (A). -3. Pull up the cover, then release the tab (C). 8. 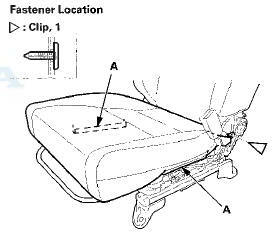 Driver's seat (manual height adjustable seat)/' passenger's seat: Gently pull out the center cover (A) to detach the clip, and release the tabs (B), then remove the cover. The passenger's seat is shown; the manual height adjustable seat is similar. 9. With back panel: From under the seat cushion, release the elastic strap (A) from the seat cushion frame springs (B), then pull back the under cover (C) of the back cover. 10. 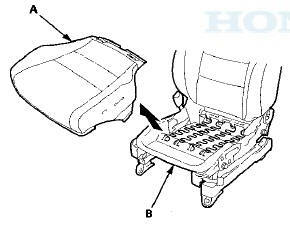 With seat heater; Disconnect the seat cushion heater connector (A) and detach the harness clip (B). 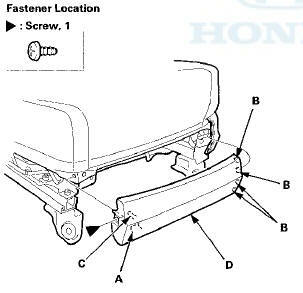 Pry up the hooks (C) of the harness holder (D), then release the holder from the seat cushion frame spring (E). 11. 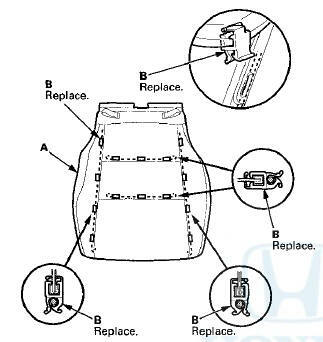 Release the Velcro fasteners (A), then pull back the harness holder covers (B) fastening the side airbag harness (C) and the seat wire harness (D) (except driver's seat (manual height adjustable seat)). 13. Driver's seat (10-way power seat): Release the hook strips (A) from both sides of the seat cushion frame. 14. Driver's seat (manual height adjustable seat)/ passenger's seat: Detach the clip, and release the hook strips (A) from both sides of the seat cushion frame. The passenger's seat is shown; the driver's manual height adjustable seat is similar. 15. Release the hook strips (A) from under the seat cushion. 16. Remove the seat cushion cover/pad (A) from the seat frame (B). 17. Release the hooks (A) from under the seat cushion (B). way around, and release the clips (B), then remove the cover. 19. Install the cushion cover in the reverse order of removal, and note these items: - if the clip are damaged or stress-whitened, replace them with new ones. - To prevent wrinkles when installing the seat cushion cover, make sure the material is stretched evenly over the pad before securing the clips, the hooks, and the hook strips. - Replace any clips (A) you removed with new ones.